This new edition encompasses current design methods used for steel railway bridges in both SI and Imperial (US Customary) units. It discusses the planning of railway bridges and the appropriate types of bridges based on planning considerations. Updated throughout to reflect changes in the field since the first edition. Examines the engineering properties of structural steel typically used in modern steel railway bridge design and fabrication. Presents criteria for the maximum effects from moving loads and their use in developing design live railway loads- which is not available in typical bridge engineering books. Explains the American Railway Engineering and Maintenance-of-way Association design specifications. 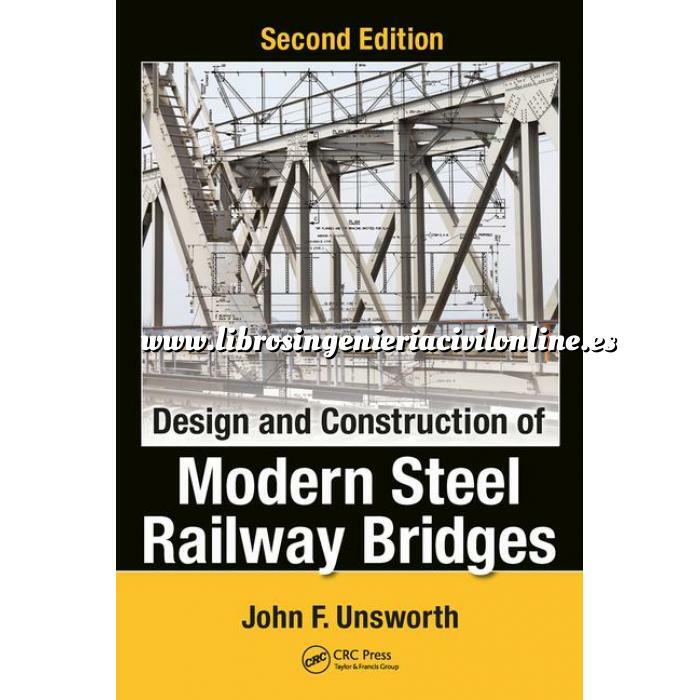 Discusses the history of iron and steel railway bridges with numerous examples. Preface to the Second Edition..
Chapter 1 History and Development of Steel Railway Bridges. 2.2 Manufacture of Structural Steel. 2.3 Engineering Properties of Steel..
2.3.1.1 Elastic Yield Strength of Steel. 3.3.2.1 Bridge Decks for Steel Railway Bridges. Chapter 4 Loads and Forces on Steel Railway Bridges. 4.3.1 Static Freight Train Live Load. 4.4.2.1 Safe Rail Separation Criteria. 4.4.2.4 Design for CWR on Steel Railway Bridges. 4.4.4 Loads Relating to Overall Stability of the Superstructure..
5.2.1 Live Load Analysis of Steel Railway Superstructures. 5.3.1 Failure Modes of Steel Railway Superstructures. 5.3.2 Steel Railway Superstructure Design. 5.3.2.3 Other Design Criteria for Steel Railway Bridges. Chapter 6 Design of Axial Force Steel Members. 6.2.1 Strength of Axial Tension Members. 6.2.1.1 Net Area, An, of Tension Members. 6.3.1 Strength of Axial Compression Members. Chapter 7 Design of Flexural Steel Members. 7.2.1 Bending of Laterally Supported Beams and Girders. 7.2.2 Bending of Laterally Unsupported Beams and Girders. 7.2.3.1 Shearing of Rectangular Beams. 7.2.4 Biaxial Bending of Beams and Girders. 7.2.7.2 Steel–Concrete Composite Box Girders. 7.4.1 Flexure in Composite Steel and Concrete Spans. 8.4 Combined Axial Forces and Bending of Members. 8.4.3 Axial Compression and Biaxial Bending. Chapter 9 Design of Connections for Steel Members. 9.2.1 Welding Processes for Steel Railway Bridges. 9.2.4.2 Fatigue Strength of Welds. 9.2.4.5 Eccentrically Loaded Welded Connections. 9.3.1 Bolting Processes for Steel Railway Superstructures. 10.3.1.1 Layout and Marking of Plates and Shapes. 10.3.1.2 Cutting of Plates and Shapes. 10.3.2 Punching and Drilling of Plates and Shapes. 10.3.3 Shop Assembly for Fit-Up of Steel Plates and Shapes. 10.3.3.4 Shop Assembly of Bolted Splices and Connections. 10.4. Bolting of Plates and Shapes..
10.5 Welding of Plates and Shapes. 10.6 Coating of Steel Plates and Shapes for Railway Superstructures. 10.7 QC and QA of Fabrication. 10.7.1 QC Inspection of Fabrication. 10.7.2 QA Inspection of Fabrication. Chapter 11 Construction of Steel Railway Bridges: Superstructure Erection. 11.2.2 Erection Methods and Equipment Planning. 11.2.2.2 Erection on Falsework and Lateral Skidding of Superstructures. 11.2.2.4 Erection with Stationary and Movable Frames. 11.3.1 Erection Engineering for Member Strength and Stability. 11.3.2 Erection Engineering for Cranes and Derricks. 11.3.5 Erection Engineering for Stationary and Movable Frames. 11.4.1 Erection by Mobile Cranes. 11.4.4 Erection of Field Splices and Connections. Appendix C: Units of Measurement.